However, today my tolerance in religious matters was pushed beyond its limits. 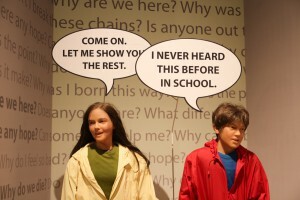 On our way from Louisville to Cincinnati, we stopped at the Creation Museum in Petersburg, Kentucky. As it says on its website, the museum “brings the pages of the Bible to life, casting its characters and animals in dynamic form and placing them in familiar settings.” It tells its visitors, “prepare to believe”. The book of Genesis coming to life? An illustrated, walktrough exhibition of the first books of the bible could actually be fun, we thought. Surely, it has to be very kitsch, but hey, why not? So we entered the exhibition halls, which were filled by animated dolls, XXL-sized screens and plastic fauna. Very kitsch indeed. My tolerance towards bad taste is really high, so I was fine with that. But what was challenging for my open-mindedness was the blunt demagogy used in the museum. Its attempt to refute all scientific achievements of the last centuries is farcical. 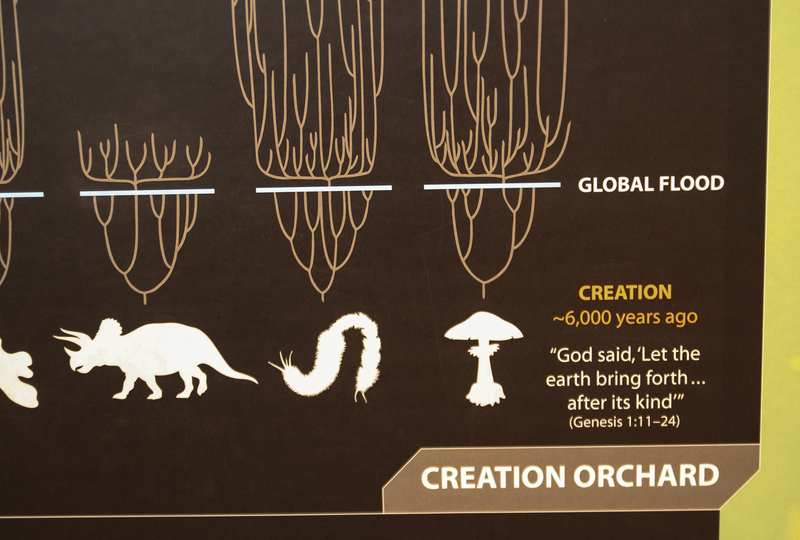 The exhibition claims that the earth was created only 6,000 years ago and it took God only 6 days to do so. Literally, 6 days. Later on, one learns that the Great Flood has created all geological formations (including the Grand Canyon) and fossils. Noah saved two of each species from the Great Flood, including the dinosaurs which went extinct only in the Middle Ages (then known as dragons) when knights used to kill them for a living. And so on. This whole Flood theory reminded me of something I read two years ago, while I was working at the Museo Palazzo Poggi in Bologna. It owns a fossil collection by two scientists, John Woodward and his student William Whiston, who also believed in the Flood geology. Too bad they lived in the 18th century and their theories were already refuted by various scientists back then. What irritates me is that people might be easily influenced by the banalities propagated in the museum if they don’t have a proper education. Here is another example of the kinds of arguments displayed in the museum: a frog has a multitude of unique characteristics that are useless taken alone. Therefore the creature and all of its features must have been created at once. So there we have our proof of God. Descartes couldn’t have done it better. Here’s the pattern again: science is (supposedly) unable to find an explanation for a certain phenomena. This is where God jumps in as the explanation. Pretty convenient, I find. While walking through the Creation Museum, I just thought what God (if there is one) would say if he actually got to see all this. As I already mentioned, the exhibition can be described as something between a blockbuster movie and a Disneyland attraction. One of the most irritating things is this deep voice of a narrator (you know, the kind of voice they use at the beginning of the “Transformers” movies), constantly following you around, that explains how God created the world in six days, why Adam and Eve were thrown out of paradise and how Noah built his Arch. The different rooms of the exhibit even have dramatic titles like “The catastrophe” or “The sixth day”. I don’t think God would be amused to see his words turned into an amusement park and being monetized like this. 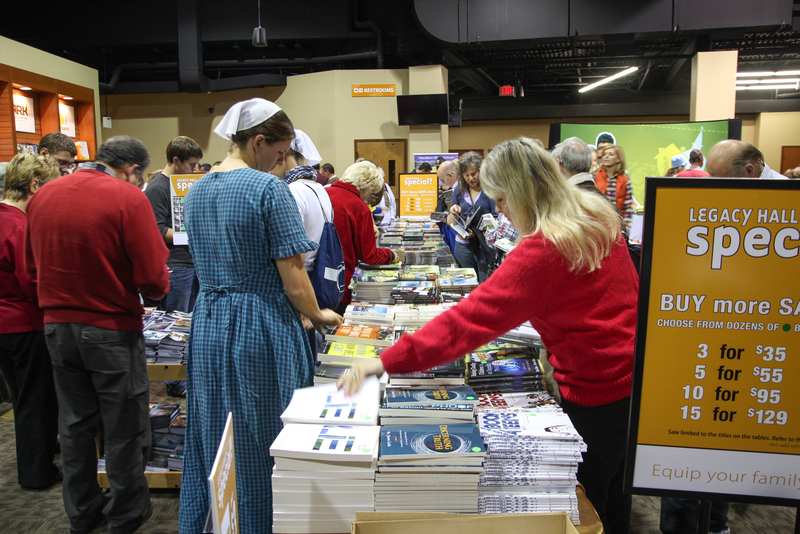 One of the highlights of our visit was the moment we met Ken Ham, founder of the Creation Museum and president of Answers in Genesis, the Christian apologetics ministry that supports young Earth creationism and a literal interpretation of the Book of Genesis. Unfortunately, we arrived at the very end of the public talk he was giving. He was advertising some of his books about creationism. 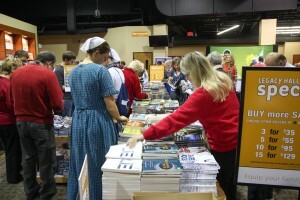 There were books for every target group: for children, for teenager, for disbelievers and many others. He seems to be a pretty good business man. He knows how to play with audiences, how to sell books, how to talk and to present himself. It’s not even relevant if he really believes in what he is selling or not. At the end, Ken talked about his last published book called “The Lie”. He calls it “his bible”. It is basically a book that he wrote decades ago and that know is being printed in its 25th (!) edition. The Creationist was bragging about the fact that he didn’t have to revise much in the book. “The arguments that I used back then are the same ones that I use today”, he explained. “And you know why? Because the bible hasn’t changed.” The audience was cheering. 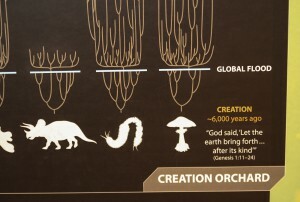 To get a detailed and brilliant description of the different rooms in the Creation Museum, I highly recommend the article Roll over, Charles Darwin! by A.A. Gill. He says everything that needs to be said about it. 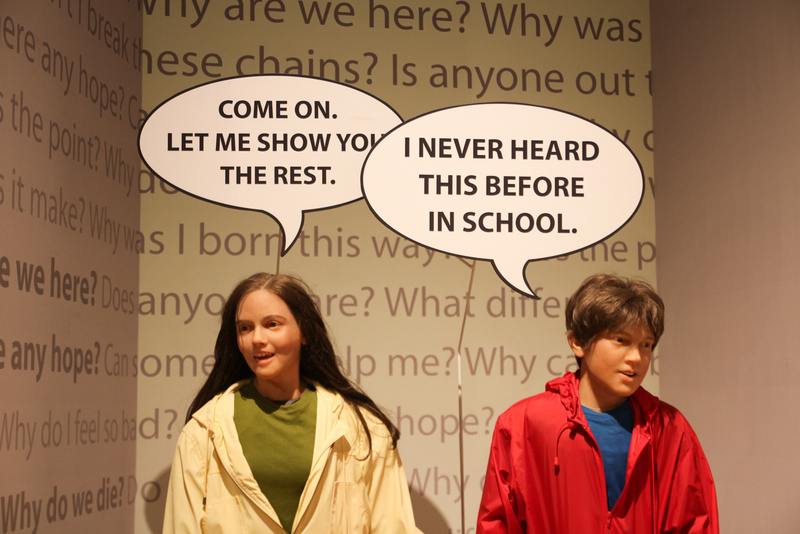 The Creationism Not-A-Museum is such an embarrassment for Cincinnati. But, it was good to meet you guys last night and I wish you well on the rest of your journey. I liked your blog, but this article was a disappointment. 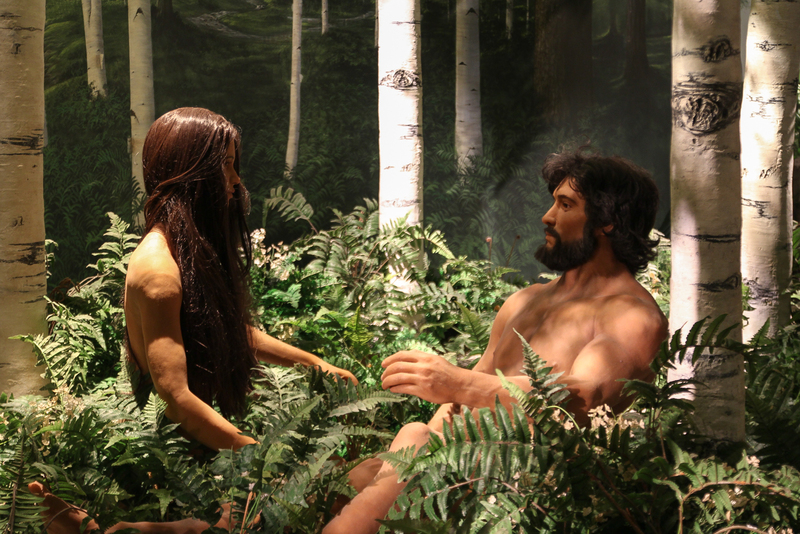 I am sorry, but what did you expect to see as you bought a ticket for a creationist museum? lt´ s like going to the beach and complaining about how much sand and water you can see there! People have the liberty to do and believe in what they want as long as they do not harm anyone. Every society can only profit from this plurality of ideas and (why not, religious) beliefs, yet the content of Mill´s political philosophy is sadly neglected nowadays, as well as every form of thinking which does not conform to the ideas propagated from the majority. I really do not see creationism as a great menace or danger for humanity although I am offended from ignorance and unscientificity. It does not make any sense to speak and write about liberty if we are not able to accept that there are people who firmly and deliberately ( they apparently do!) believe in something that we may find (and is) absurd, kitsch, ridicule, grotesque and unscientific. You have every right not to believe in creationism, to criticize it, but why write such an article, if your is not a satirical one? You just ridiculed these people and the author of the book ( The creationist, bragging, banalities…) for having ideas and beliefs which are opposite to yours. That´s intolerant and I really can´t understand it. Interesting discussion. But I think writing about liberty and being a firm believer in liberty shouldn’t prevent anyone from expressing critical views about others’ opinion. Of course the more absurd one finds these other opinions the more direct the criticism becomes without actually meaning to ridicule its holders. But the distinction can be a very fine line, of course. It may not be a great menace, but it certainly is a major problem in large parts of the USA. Creationists have a tactic of taking over school boards (in a relatively small number of people, one church all voting collectively can easily influence an election) and preventing evolution from being correctly taught in local schools or even statewide in Texas, Kansas, etc. I have no problem with people privately believing something no matter how easily it may be disproven, but the nature of these christian evangelical organizations is that evangelizing and prozelytizing are key parts of their faith. In other words, it is not enough that they believe, they need everyone else to believe it too. I think it is important for the education of our children that we stand up against this. And ridicule is the best weapon against the ridiculous.